This beautiful piece of shiny scientific instrumentation is a brand new class X-ray microscope sitting inside a vacuum chamber at Brookhaven National Laboratory. Things have sure changed since we were at school. Delivering the capability to image nanostructures and chemical reactions down to nanometer resolution requires a new class of x-ray microscope that can perform precision microscopy experiments using ultra-bright x-rays from the National Synchrotron Light Source II (NSLS-II) at Brookhaven National Laboratory. 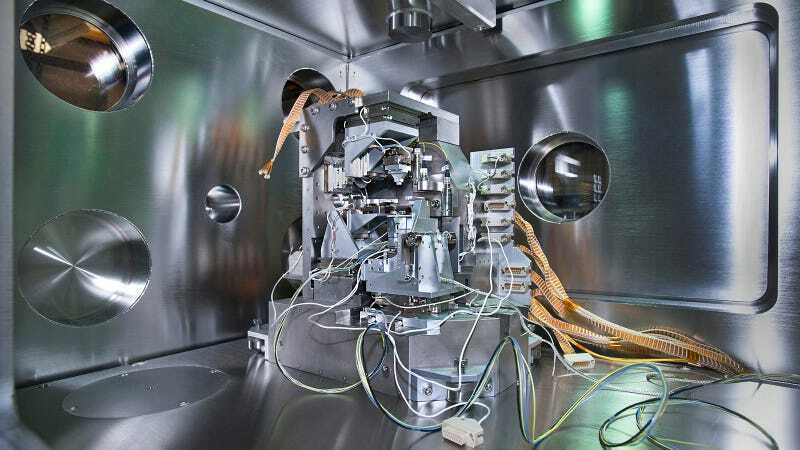 This groundbreaking instrument, designed to deliver a suite of unprecedented x-ray imaging capabilities for the Hard X-ray Nanoprobe (HXN) beamline, brings researchers one step closer to the ultimate goal of nanometer resolution at NSLS-II. The microscope manipulates novel nanofocusing optics called multilayer Laue lenses (MLL) — incredibly precise lenses grown one atomic layer at a time — which produce a tiny x-ray beam that is currently about 10 nanometers in size. Focusing an x-ray beam to that level means being able to see the structures on that length scale, whether they are proteins in a biological sample, or the inner workings of a fuel cell catalyst.